Couple of days ago I tidied up the basement and found old golf membership cards. I tend to collect them in one place but apparently I had a bunch of them in a different spot – like always when you are looking for something. What I realized to my surprise was that my handicap, not that long ago, was much better than the one today. I play tournaments regularly and my handicap is adjusting to that, but it seems that for too long now my handicap only knew one direction: up. So this is going to change now. More focus on training, a more reliable swing, intelligent course management and ball striking with the longer woods. That’s my approach for this year. Needless to say that most of the deficiencies have their origin in suboptimal striking, a non-consistent swing and too little training or play, but the equipment of course plays its role, too. So I’m happy to trust my PING G400 set: driver, 3-wood, 5-wood, 19° hybrid, irons from 4 to 9, then W, U, S and L from the same set, plus my trusty Scotty Cameron California Del Mar putter. A tough round deserves a new handicap! Last week I fortunately made a small step into the right direction, handicap-wise. I played the monthly club championship and somehow managed to withstand the windy and rainy conditions and carded down an 87 in the end. It’s been a while that I played a +15 round, especially on such tough course like the Nessie at Golfpark Bachgrund. It wasn’t just pouring down in between, the course has loads of water hazards to offer. That was basically the reason I left all my woods in the trunk of my car and played only irons, up to my 2-iron. That turned out to be a very conservative but smart idea. And I prefer smart over pretentious. It was a Stableford tournament and I ended up 2nd net in my class and 6th gross overall—which is pretty cool I have to admit. I’m sure I never made it that high on the overall tournament leaderboard ever before. The stretch of holes 5 to 11 I played even par, only one bogey with one birdie. After that I somehow fell back into my bogey habits and lost 7 strokes on the last 7 holes. That was definitely not because of bad putting. 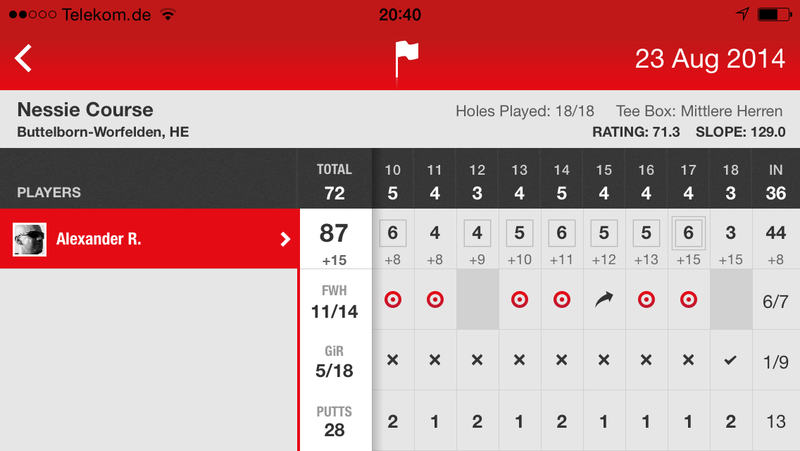 The putter was hot that day and for the last 7 holes I only needed 10 putts, 28 in total—which is not bad at all. With this round I lowered my handicap down to 14.8 and am a bit closer now to the end-of-season goal of 12. Let’s see, I’m pretty confident that there is more to squeeze out, but obviously as well a lot of work to do. I was at my local Waterstones store lately during lunchtime. It was a Friday and I was about to leave London for my weekend break in the evening. And I passed the book shelves that say SPORTS and usually you see lots of Arsenal London, Chealsea or Manchester United books in there, possibly next to books about cricket, horse riding and gardening – oops that was the next section! Anyway, there were a couple of golf books too, as you could imagine for a nation that claims to be the inventor of this beautiful sport. At least if you take the UK as one nation, which is often not the case in people’s minds. There were many books for golf beginners, that I wasn’t interested in, how to swing, how to stand, how to grip, this kind of stuff; boring. Next to that there were some books that focussed on the mental part of the game, “playing better through thinking better”, something like this. Titles like “The 15th Club”, “Inner Game of Golf”, “Fearless Golf”, “Find the Zone”… No need for that! My brain works perfectly fine and I don’t need physiological advice! What I am interested in is how people really achieved to get better, about professional play and true stories of golf. I found one great little book and started reading in the tube on my way to the airport. I continued reading it on the plane (no need to switch off the iPad during start and landing!) and finished the last page of the book in Frankfurt at the baggage claim. That was a quick one! But definitely worth a read. I couldn’t resist and bought it. The narrator is a fairly old gentleman who starts playing golf and his obvious wish is to play better and to control the game, breaking 80 (which I never did so far by the way). 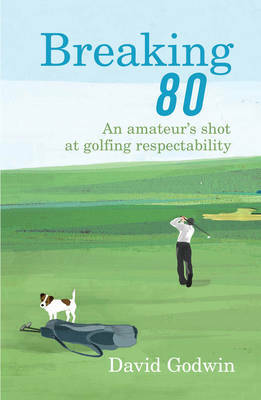 It’s a nice little story, very personal, very much focussed on golf, so perfect for a little read to stay in the mood. Need to play more Rounds! That’s what I learned from my last tournament and from a training session I had last week with my golf teaching pro near Frankfurt, Germany. This year leaves mixed feelings. Yes, I’ve been to two incredible courses around London and yes, it was great fun. And yes, I was playing a tournament lately and yes I scored 39 points… BUT these three rounds were the only rounds I was playing the whole year! Can you imagine that?! For a golf-maniac like I am, nothing is worse than not being on the course, believe me! Yes I miss that! The old golf course accessibility I was used to. With that my handicap would drop, I feel that… But I can’t help it. I have to live with it and to make small steps to my single handicap. Richard, my teaching pro, has some valuable tips for me. Still playing with too much draw he taught me how to swing a bit more from the inside to the outside, what is – as far as I was believing – the wrong approach since it seems I cut the ball more, but actually it’s the other way around. In my current normal swing, I kinda fall back (leaning too much to the right side) in the follow-through, what leads to left-orientated ball flights. Eliminating that by increasing the downswing to the outside corner, reduces the left cut and produces dead straight balls… finally! after the last couple of rounds i made some additional adjustments to my swing. i had the feeling that there is definitely some improvement possible without any professional help. so i altered here and there and am quite confident that i can reduce some additional strokes on the round. especially with my woods, i always had the feeling, that i was standing too close. the result was an outside-inside upswing and some negative effect on my downswing, where i had to push the ball. combined with weight shift during the swing and a closed club face, that led to a dirty hook. i hope that i can make some more improvements in this field, since this hook is really annoying me!! but a bit more distance to the ball at address and therefore a more solid swing on the backswing is a good starting point i guess. next issue i was working on is my wrist action through the downswing and at impact. the reason for that is that i always had the feeling that the club face was perfect at address but more or less closed at impact because of position transfer and weight shift during the downswing. in my opinion that could have led to my pull-hook of the last months. so what i tried is to accelerate the opening of the club face in the upswing and to really delay the closing through the downswing. result should be a more open club face at the center of the body and combined with weight shift a perfect parallel club face at impact. that would lead – in my case – to beautiful dead straight ball flights. i see so many newcomers on the range, guys that are playing just for month and they are really hammering the ball instead of swinging through it! these greenhorns have twice the swing speed than mine, with 4 times strain, much less flight control and no fun at all – and only one third of my distance! i tried to reduce the swing speed even more over the last month and – guess what – the balls travel further and much straighter. all that with better swing rhythm, less speed, better path and much less use of force. that’s because exertion of force is contradicting the beauty of the swing and of the whole sport, i do believe! you know what i mean when you see mid-aged men swinging like hell, losing total control of their shots and as well of their own balance. i will never understand these people and their ugly approach to this beautiful and athletic sport!!! believe me, guys: less upswing, less speed goes hand in hand with more distance, more control, better trajectory and more birdie chances (what equals a lot of fun)! take me as an example: i’m reducing my swing speed constantly and i have next to not one single miss-hit on the round!